These three stats on customer review supports the notion that customer review can bring in foot traffic to your brick and mortar store. Search Engine Optimization (SEO) helps in online visibility, but seeing a review can stop a customer from scrolling down a search results page and may make them look at your business closer than the ones that does not have it. My husband and I recently needed a roofing company for our property. Where do you think did we look for roofers? Not the yellow pages! We combed the internet for roofing companies. Also, we looked for and read every customer review we can find. There were only a few customer reviews for that niche. If you are a business, you should know by now that the internet and the increasing use of smart devices have given your customers, and prospects, the power to know more about you and to talk more about you in different social media platforms. Consumers glean online reviews made by peers – fellow customers. Business Implication: More and more online users will be looking for what other consumers are saying about you and your product. Consider gathering customer review from your customers a part of your marketing strategy. Encourage them to leave a review on social media platforms like Google+, Facebook, Yelp and other sites. Business Implication: A customer review can sway a prospect’s purchasing decision. Is that not the reason we read reviews on Amazon, Netflix, Yelp or TripAdvisor? As consumers, we wanted to make intelligent purchasing decision before we click, “Buy Now.” Therefore, we try to listen to what others who have already used the product or service say about their experience. That is what consumers are doing before they decide to buy from your business. Business Implication: It is a best practice that you acknowledge reviews left by your customers. I have come across customer reviews that have not been acknowledged by some businesses on TripAdvisor and Yelp. The example below is from a Facebook business page where the company acknowledges only the positive reviews but skips the not-so-stellar reviews left by customers. The business never bothered to ask the customers what they didn’t like about the product or service so they can address it. Your reply should be the last voice that a consumer reads the thread initiated by the unhappy client whether he/she responds, or not. It’s hidden implication to a customer is that customer care is alive and well in your business. 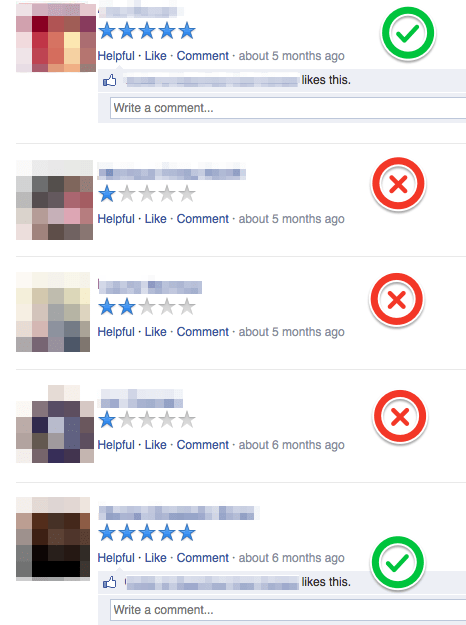 This company acknowledged all the 5-star feedbacks but skipped (in red) others that are not stellar. A survey by Yelp and Bazaarvoice indicates that there may be 20% of customers that will not be happy with a product or service they’ve purchased. And that customer will likely share their experience about it. 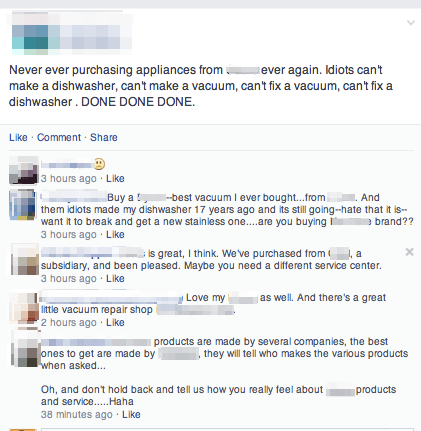 According to Loudhouse, “shoppers will punish brands for bad customer service, with 44% sharing negative experiences with friends and family and 13% sharing on social media.” Here is one classic example. This is how peers (fellow consumers) share their experience (review) about a particular brand. The internet has given them the power to do that. I bet you have seen this type of post, haven’t you? Any business wouldn’t want to see that kind of chatter happening online about them. Is getting consumer review part of your marketing strategy? How do you do it?